Coronal holes are places where the sun’s magnetic field opens up and allows solar wind to escape. This hole is straddling the sun’s equator so the solar wind stream emerging from it will intersect Earth’s orbit. ETA: May 16-17. High-latitude sky watchers should be alert for auroras on those dates. Coronal holes are places in the sun’s atmosphere where the magnetic field bends back and allows gas to escape. From such openings, solar wind blows out into space. A stream of solar wind flowing from this particular coronal hole could reach Earth on May 11-12, sparking auroras when it arrives. On the other hand, the stream might sail south of our planet, delivering only a glancing blow. Stay tuned for updates. A gigantic square hole has been video-captured on the Sun’s surface by NASA’s Solar Dynamics Observatory (SDO). The particularly large monstrosity, known as a “coronal hole”, is an indicator of solar winds ejected out of the star at insane speeds. An X-class solar flare on April 25th irradiated Earth’s upper atmosphere with extreme ultraviolet radiation, causing a widespread blackout of shortwave radio transmissions. “This is a dynamic spectrum,” explains Flagg. “The vertical axis is frequency (MHz) and the horizontal axis is time (UTC).” All of the horizontal lines corresponding to terrestrial radio stations vanished in the aftermath of the flare. The active region responsible for the flare rotated off the solar disk yesterday, so even if it flares again, another radio blackout is unlikely this weekend. NOAA forecasters estimate the odds of an X-flare on April 26th to be a scant 1%. An X1.3-class solar flare (far right) erupts from the surface of the sun on April 24, 2014 EDT (April 25 GMT). The sun erupted with a massive solar flare late Thursday (April 24), triggering a temporary communications blackout on some parts of Earth. 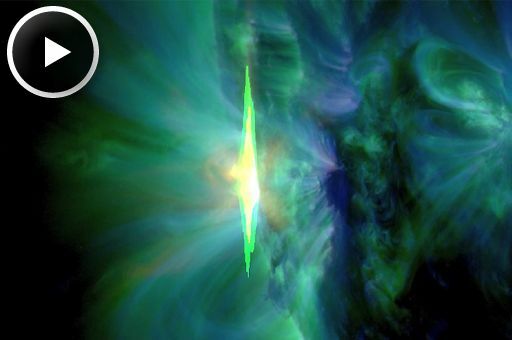 The powerful flare peaked at 8:27 p.m. EDT Thursday (0027 April 25 GMT), and ranked as an X1.3-class solar storm, one of the strongest types of flares the sun can experience, according to a report from the U.S. Space Weather Prediction Center. NASA’s sun-watching Solar Dynamics Observatory captured video of the intense solar flare in several difference wavelengths. Rare Ripple in Earth’s Magnetic Field Occurred During Last X1 Solar Flare! “The Doppler shift of the WWV signal (the ‘wobble’ just before the blackout) was nearly 12 Hz, the most I have ever seen,” says Nelson. The flare not only blacked out radio signals, but also produced some radio signals of its own. 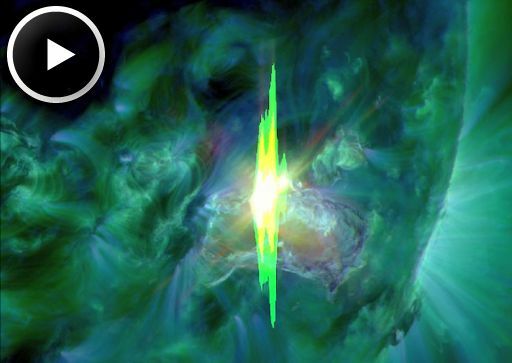 The explosion above sunspot AR2017 sent shock waves racing through the sun’s atmosphere at speeds as high as 4800 km/s (11 million mph). Radio emissions stimulated by those shocks crossed the 93 million mile divide to Earth, causing shortwave radio receivers to roar with static. Here is a plot of the outburst detected by Nelson using a 20.1 MHz RadioJove receiver. Elsewhere, strong bursts were recorded at frequencies as high as 2800 MHz. It was a very broad band event. The flash you just saw was extreme UV radiation, the type of radiation that ionizes the upper layers of our atmosphere. In this case, the ionizing action of the flare led to a rare magnetic crochet, measuring 17 nT at the magnetometer in Boulder, Colorado. A magnetic crochet is a ripple in Earth’s magnetic field caused by electrical currents flowing in air 60 km to 100 km above our heads. 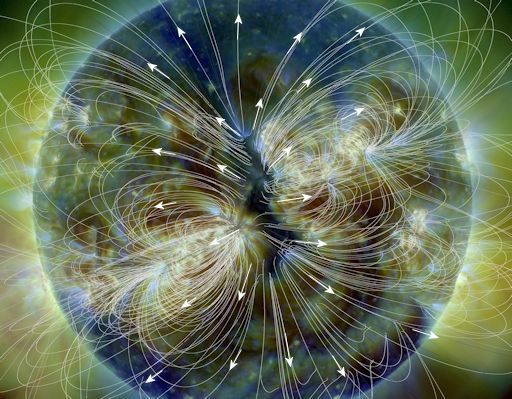 Unlike geomagnetic disturbances that arrive with CMEs days after a flare, a magnetic crochet occurs while the flare is in progress. They tend to occur during fast impulsive flares like this one. The magnetic field of sunspot AR2017 is decaying now, but it still poses a threat for eruptions. NOAA forecasters estimate a 55% chance of M-class flares and a 20% chance of X-class flares on March 31st. NOAA forecasters estimate a 70% chance of M-class flares and a 15% chance of X-class flares during the next 24 hours. “AR2002 is so large,” says Ahmad, “that I was able to photograph it using an ordinary 11-inch Celestron telescope capped with a Thousand Oaks Glass Filter.” The exceptionally crisp image shows thousands of boiling granules surrounding the sunspot’s dark cores. Each granule is about the size of Texas. The rapid growth of AR2002 has destabilized its magnetic field, which makes it more likely to erupt. NOAA forecasters estimate a 70% chance of M-class flares and a 15% chance of X-class flares during the next 24 hours. The massive X4.9-class solar flare erupted from an active sunspot, called AR1990, at 7:49 p.m. EST (0049 Feb. 25 GMT). 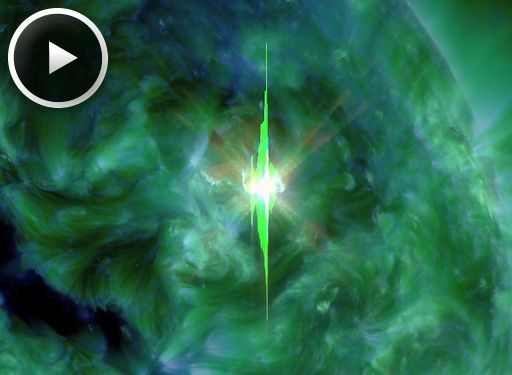 NASA’s Solar Dynamics Observatory captured high-definition video of the monster solar flare. The spaceecraft recording amazing views the solar flare erupting with a giant burst of plasma, called a coronal mass ejection, or CME. 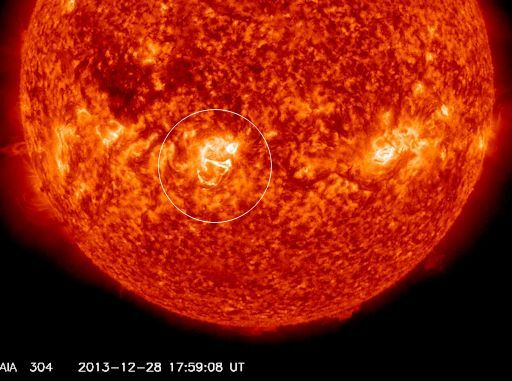 A giant solar flare, an X4.9-class sun storm, erupts from the sun at 00:49 GMT on Tuesday, Feb. 25 (7:49 p.m. Monday, Feb. 24 EST). This image of the flare was captured by NASA’s sun-watching Solar Dynamics Observatory. Large Debris Around the Sun.Update. 2 large objects caputured on Lasco C2 During a solar flare. The movie shows a dark filament of plasma racing away from the blast site, but most of the material fell back to the stellar surface. Nevertheless, the explosion did produce a CME that could deliver a glancing blow to Earth’s magnetic field later this week. NOAA analysts are still evaluating this possibility. The M9-flare of New Year’s Day followed close on the heels of an M6-flare on New Year’s Eve. Sunspot AR1936 produced both explosions. The New Year’s Eve event produced a minor, slow-moving CME that is not expected to disturb Earth’s magnetic field if and when it does arrive. 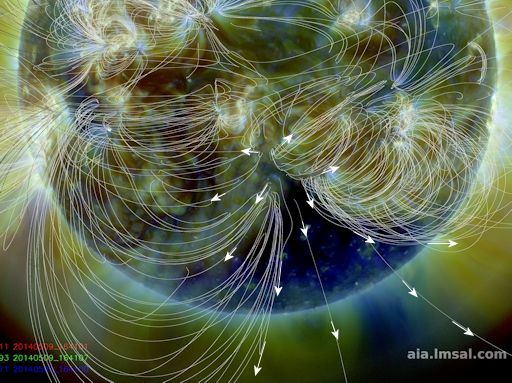 Because of foreshortening near the sun’s limb, the complexity of AR1944’s magnetic field is still unknown. The sheer size of the sunspot, however, suggests it is capable of strong flares. The emergence of AR1944 combined with the ongoing activity from AR1936 has prompted NOAA forecasters to raise the odds of eruptions on Jan. 2nd to 70% for M-flares and 30% for X-flares. Our Solar System is Moving thru Heavy Debris. 2 Large Solar Blast. Fireball Reports Coming in from the UK. Because the sunspot is facing Earth, any flares emanating from it are going to be geoeffective. So far, the extreme ultraviolet “crackles” have produced only minor waves of ionization in our planet’s upper atmosphere. Earth-effects will increase, however, if the activity continues to intensify. Eruptive M-CLASS SOLAR FLARE ! A strong M3.5 Solar Flare was reported at 23:19 UTC yesterday around active region 11931. The impulsive eruption occurred while the active region was rotating onto the earth-facing side of the disk. Radiation from the flare produced a brief wave of ionization in the upper atmosphere over the Pacific side of Earth. Otherwise, the blast was not particularly geoeffective. It did not produce an Earth-directed CME. ISON’S Incoming Debris Hitting the Sun. Large Solar Flares. Earth Will start passing thru this trail on Jan 12th thru the 19th.